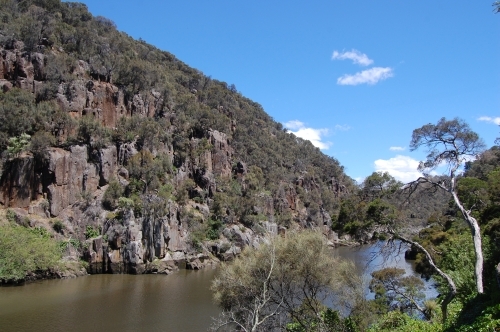 The 23th Dec 2008 marks my first visit to the famous Cataract Gorge, Launceston. It’s almost shameful that I lived on this beautiful island for 4 years before paying the gorge a visit. As I didn’t have much time I merely took a short walk along the tourist track. The first thing that struck me botanically was the the exuberance of exotic ornamentals. There were whole colonies of Red Velerian or Kiss me Quick (Centranthus ruber), Blue Periwinkle (Vinca major), Blackberry (Rubus fruticosus aggregate) and more. By way of native plants, I was most delighted to see the Common Raspfern (Doodia australis). 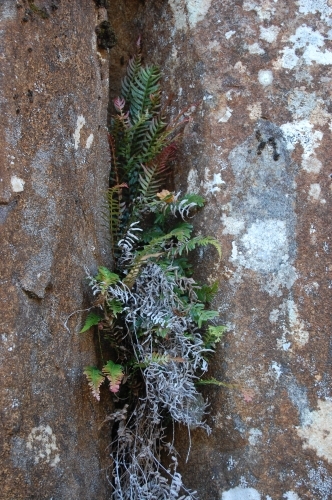 This would be be the first time I am seeing this fern growing naturally. Also, I was struck by the preponderance of a native moss, Rhacocarpus purpurascens, growing on boulders there. This moss is more often found growing in alpine tarns (see my post on this moss). My honours project supervisor, Paddy Dalton, told me that he collected this moss in fruit once for this locality. Personally, I’ve seen it scores of times on Mt Wellington but I’ve never seen capsules. Could there be something interesting going on here? I’ll be back for another visit sometime. This entry was posted in Ferns, Rambles and tagged Cataract Gorge, Common Raspfern, Doodia australis, Launceston, Rhacocarpus purpurascens. Bookmark the permalink.